We had hoped to return from Toledo in time for the Gay Pride Parade, and we did! We arrived back in Madrid around 6 pm and we were anxious to get down to the Gran Via to see the parade. 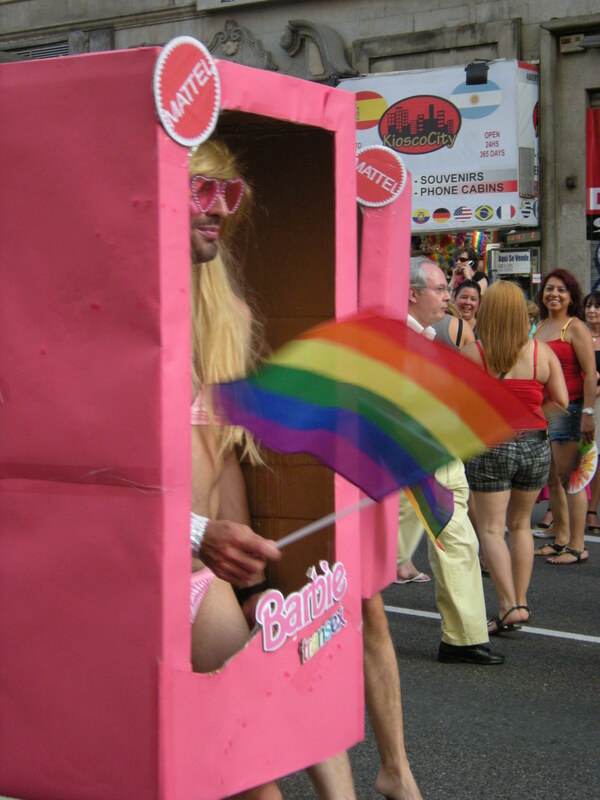 This is held every year in Madrid, after a weeklong series of events around a theme (this year it was transsexuals). The parade was rather disorganized compared to an American parade so that there was a large gap between groups. 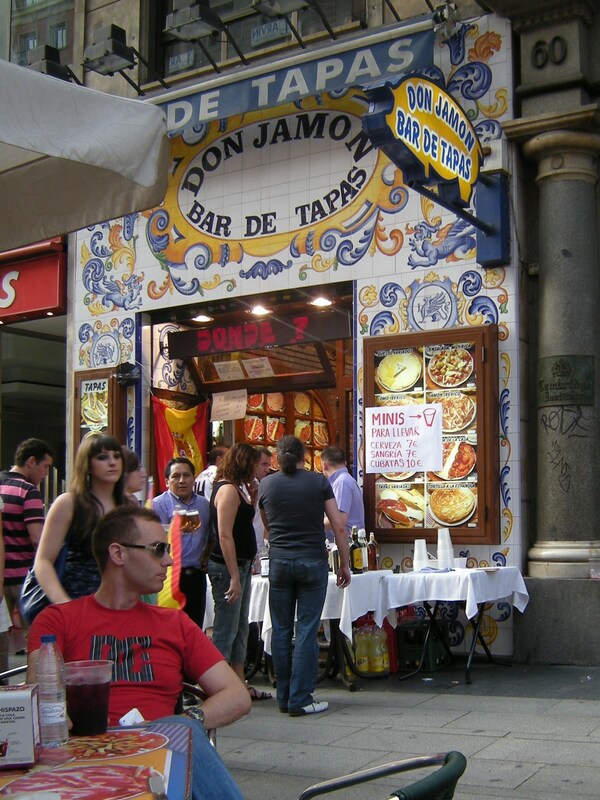 About 6 of us gathered at a tapas place on the Gran Via and ordered a bunch of tapas and sangria. This was in order to get good seating along the parade route (the waiter brought a table and chairs out from inside the restaurant for us) and to have something to do while waiting! Besides we were pretty hungry by this time! All of us took lots of pictures of this event, some tame, some outrageous. Some young Spanish women with Spanish flags painted on their faces told us to be sure to wait for the floats at the end. Well, we waited and waited, and eventually the waiter cleared off our table while we stood or sat in the street. Meanwhile, the semifinal soccer game of the World Cup Spain vs Paraguay was being broadcast in every establishment along the street and shouts went up periodically so one of us would run in to peer at a TV to see what was going on. Spain made or almost made two goals which were for some reason not counted. Cheers also went up when Spain’s goalie blocked Paraguay from scoring. The few of us who remained at the parade came to the conclusion eventually that the parade was over – people were walking in the streets, some of the people who had already paraded returned to parade again, and there didn’t seem to be any music or floats that were visible above the crowd. We decided to go back to Barradas where we could still have dinner (not that we needed it anymore) and watch the game on TV. Some wanted to go to a bar, but they all ended up in front of the TV near the dining room. Spain won 1-0 and we saw these exciting last minutes of the game! route, where we were, until 10:30! ), the euphoria over Spain’s victory was a cause for partying for most of the night. I stayed up reading and writing until about 12:30 because it was so noisy, and then during what I thought was a lull, I went to bed. Needless to say, I was awakened countless times by partiers in the streets below, until well after 4 am. On a Saturday night, that was to be expected, I guess. Fortunately we got to sleep late on Sunday so I finally got some decent sleep between about 5 am and when I got up at 10 am! 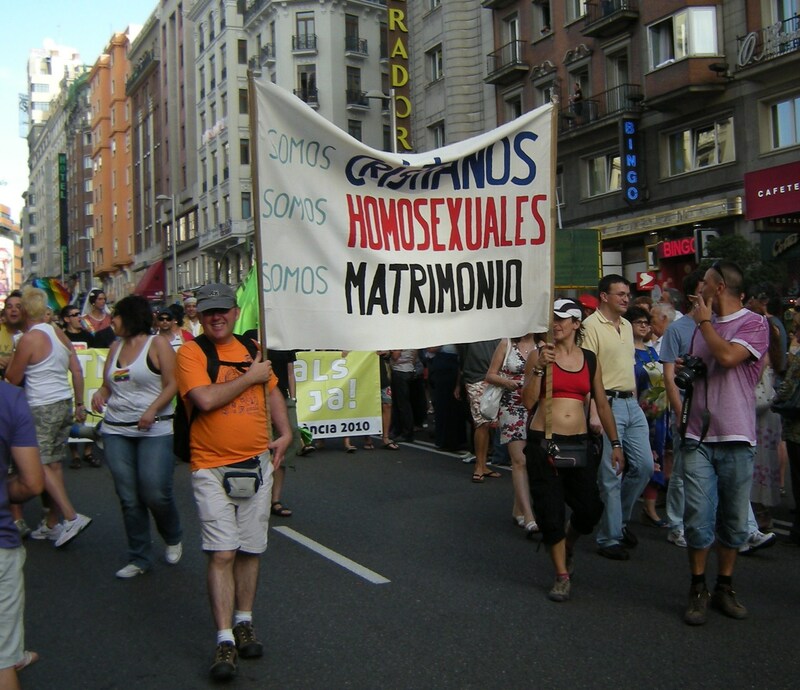 The sign reads: We are Christians, We are homosexuals, We are marriage.